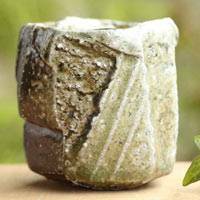 Takeshi Shimizu, Wood-fired Salt Glazing Water Cooler 330ml, Yuzamashi, Japanese Tanbayaki pottery Our settlement currency is Japanese Yen. The price in other currencies you see here is just for the reference. You will eventually pay in your own currency at the current exchange rate provided by credit card company or Paypal. 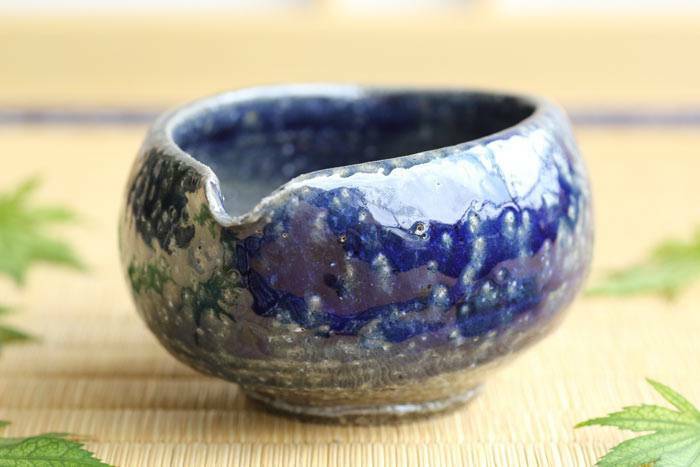 SALT GLAZING: The salt tossed into several rounds when the wood fired kiln is at its hottest, the salt turns into glassy oceanic blue upon reacting with traces of cobalt. 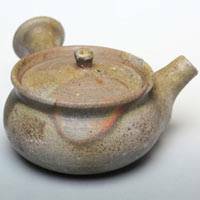 A Tamba-ware artisan and stylist extraordinaire, Takeshi Shimizu is best known for two ceramics techniques: striation, and salt-glazing. 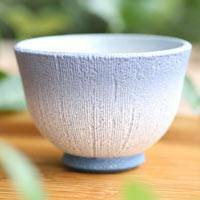 On Shimizu’s signature kokumon, or striated, pieces, innumerable fine grooves cut through a field of subtly gradated color, turning a simple bowl or cup into a dramatic landscape of peaks and valleys. 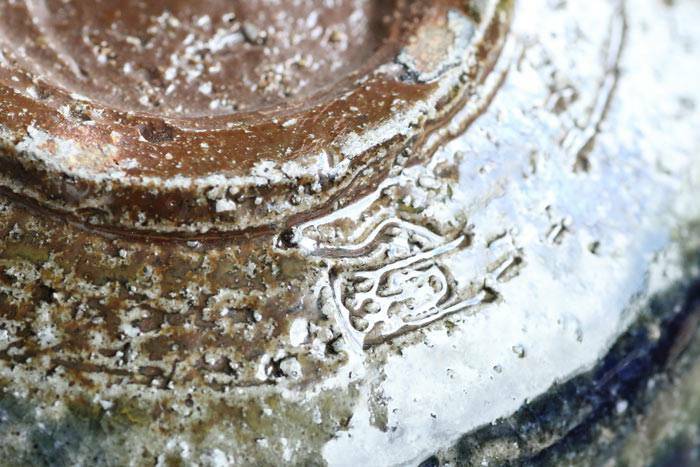 After shaping a piece, the artist carves out a series of grooves. A sponge laden with slip adds heft to the ridges between, emphasizing the design’s three-dimensionality. 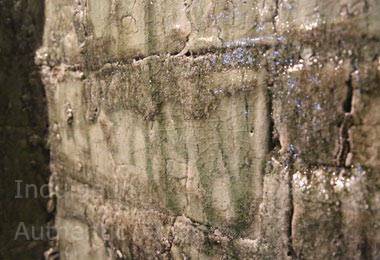 The raised portions are then smoothed and compacted with a plane, and the process is repeated several times. 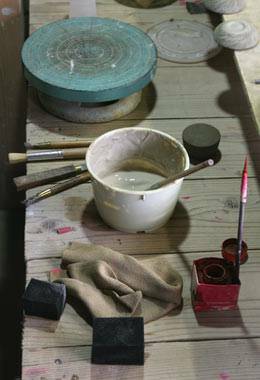 When this finishing is complete, new, contrasting clay is set in place in the grooves themselves. “I don’t think anyone else would stand for something so tedious,” Shimizu says with a grin. 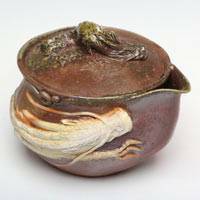 The artist’s other signature style, salt-glazing, substitutes painstaking handiwork with the vagaries of the firing process. 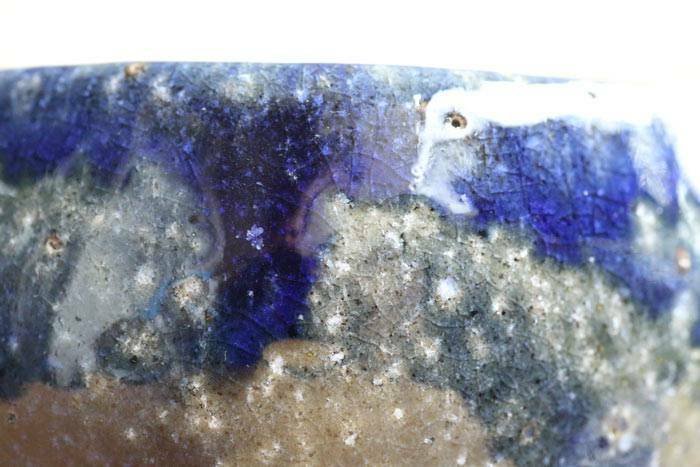 Salt is tossed onto pieces in a wood-fired kiln, and turns a glassy, oceanic blue upon reacting with traces of cobalt. 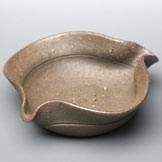 Salt-glazing is thought to have originated in 16th century Germany, but was incorporated into Tamba-ware, native to Hyogo Prefecture, only after World War II. 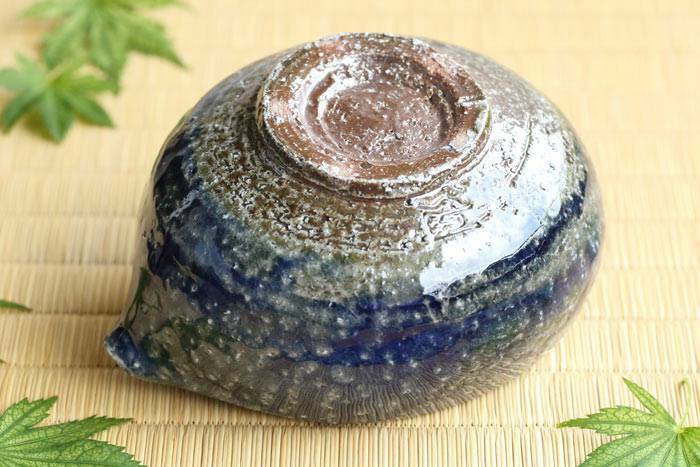 Shimizu is the only current practitioner of the hybrid style in the Tamba region, and his peers across the country can be counted on one hand. 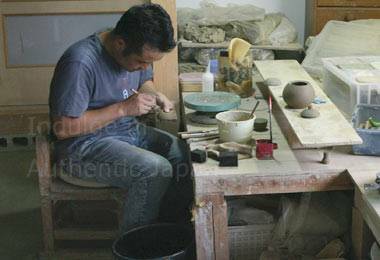 Producing salt-glazed pottery requires painstaking work of its own variety. 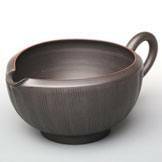 To create the characteristic finish, the temperature within a wood-burning kiln must be carefully monitored throughout the three- or four-day-long firing process. 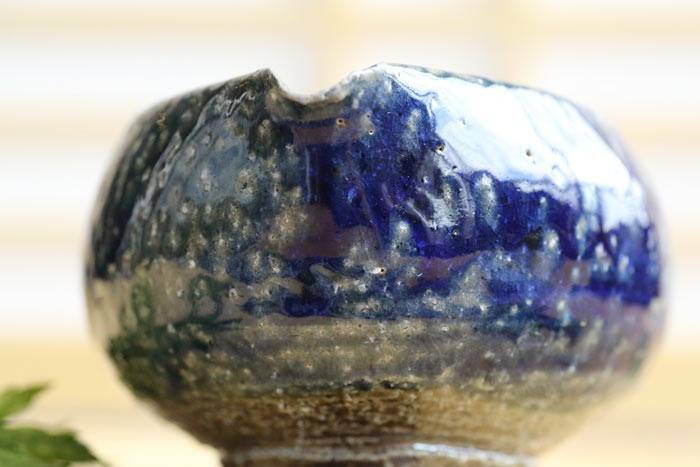 Salt is tossed in several rounds when the kiln is at its hottest. 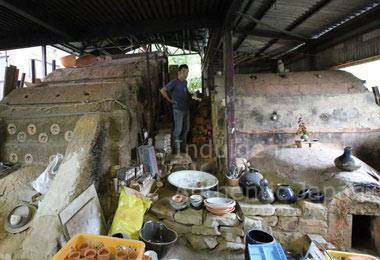 But, of course, opening the kiln causes the temperature inside to plunge, requiring adjustment and re-heating after each addition. 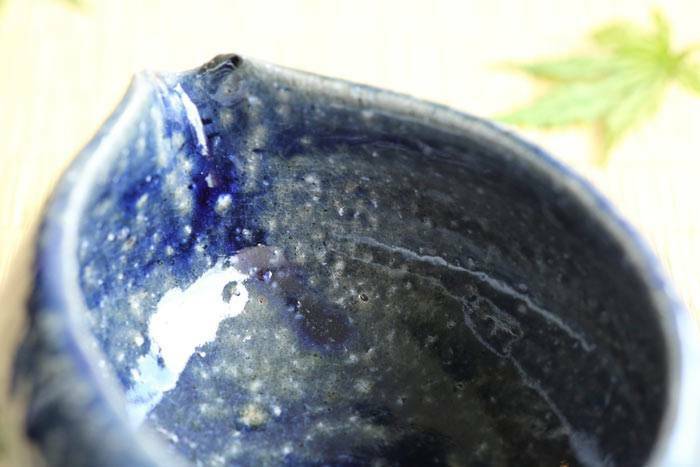 The technique is also somewhat hit-or-miss: salt tossed into the kiln does not fall evenly across all pieces, meaning only a few wind up with the ideal blue coloration. 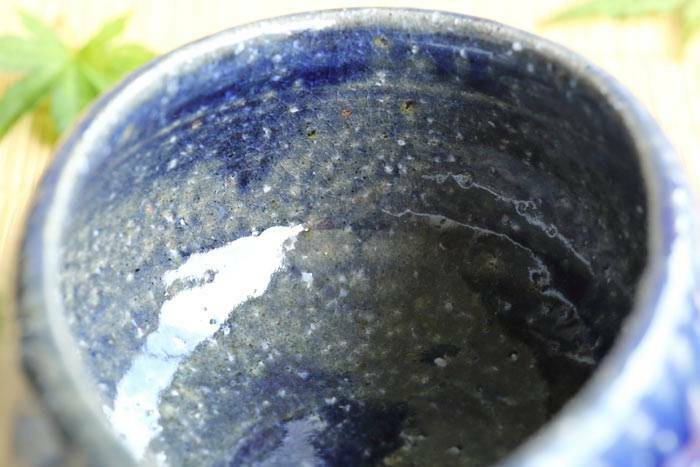 Salt-glazing also drastically reduces the life of a kiln. 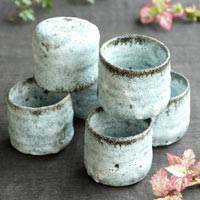 "When superheated salt cools down, it becomes like glass, and sticks like glue to every part of the kiln,” Shimizu says. 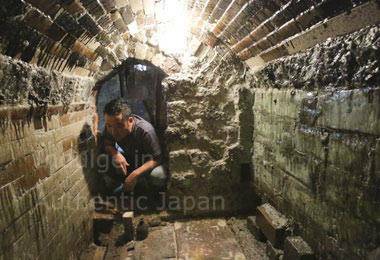 “It even falls into the opening to the fire chamber, and clogs up the pathway through which heat travels. 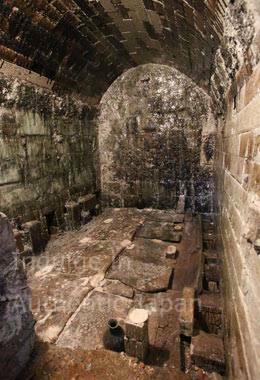 This means the floor of the kiln gradually sinks -- I even once had the ceiling crumble while pieces were inside firing. 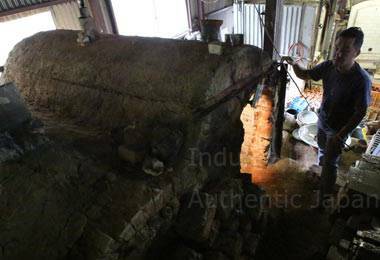 Maintenance is far more cumbersome than for a typical wood kiln." But the pain pays off. 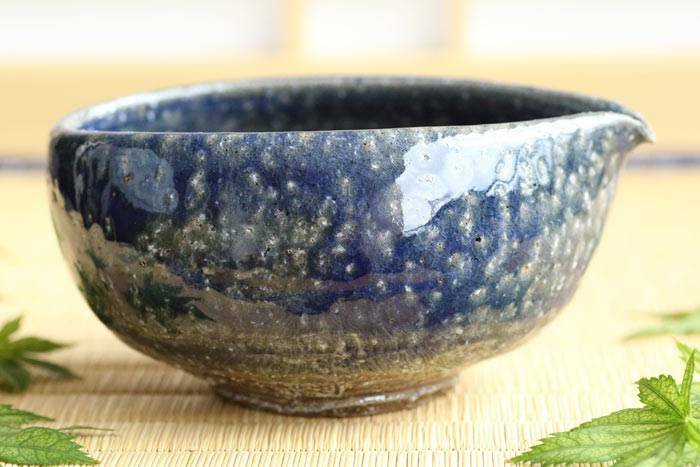 The blue that salt-glazing produces "is exceptionally fresh and natural," Shimizu said. 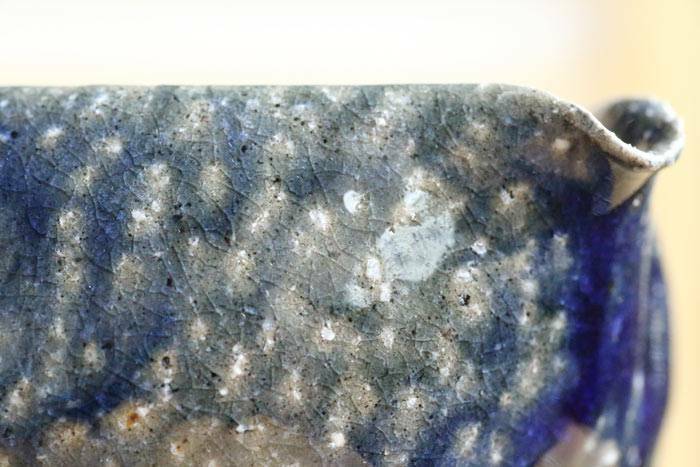 "It has both a transparency and a depth to it, and manifests in various shades. 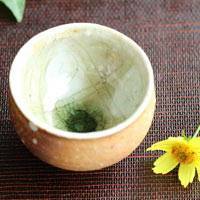 Wood and salt combine to bring white, grey, and green into the mix as well. 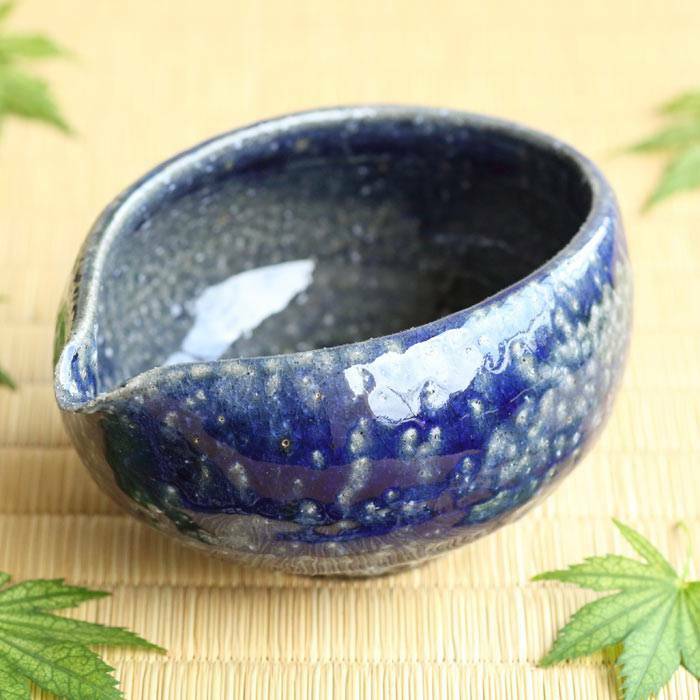 It's very interesting -- an extremely rich, expressive color." 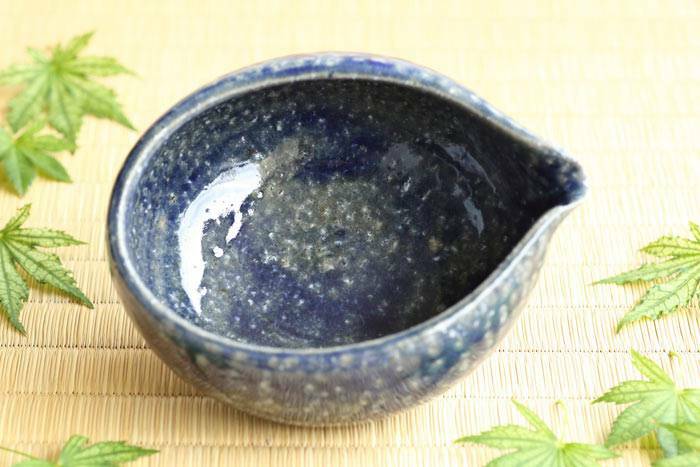 Ceramics run in Shimizu's blood. 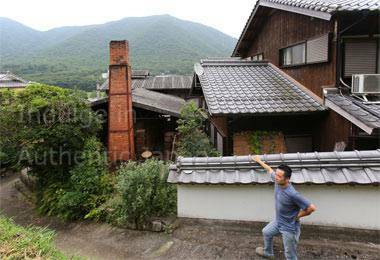 He was born in Tachikui, Hyogo -- the seat of Tamba-ware -- in 1975, the oldest son of a ceramics family. Yet he was never particularly drawn to the craft during childhood, and rarely assisted his parents with their work. 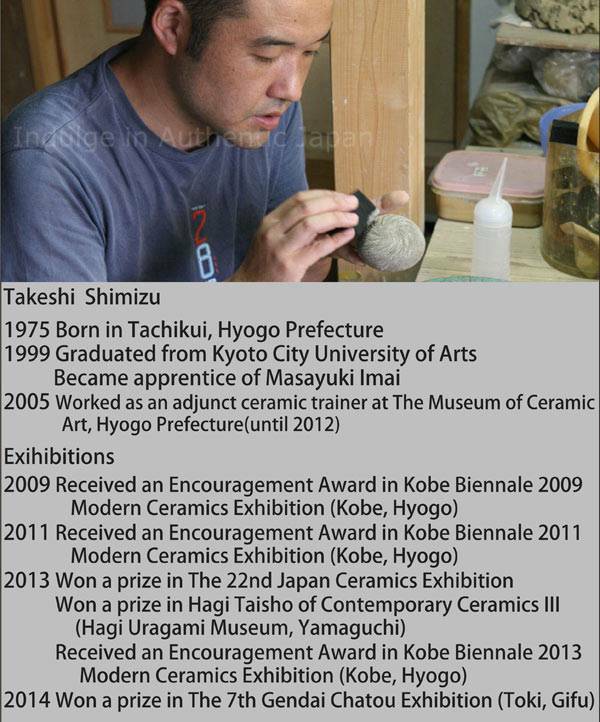 Shimizu later enrolled at the Kyoto City University of Arts, where he studied traditional handicrafts. 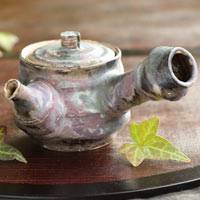 After graduating, he began an apprenticeship under Masayuki Imai, a world-renowned ceramics artisan known for his intricate men-zogan, or plane-inlay work, in which a design carved into a piece is filled with clay of a different color. 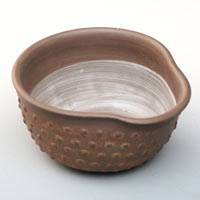 This requires careful planning: various clays contract to differing degrees in the kiln, creating cracks or gaps between the inlay and base clay if precautions are not taken. While a number of artisans are capable of inlaying simple grooves, Imai was the first in the world to create an intricate inlay design covering the face of a piece, fitting shapes and slabs of multiple colors together like a jigsaw puzzle. The life of an apprentice, it seems, has changed little over the years. 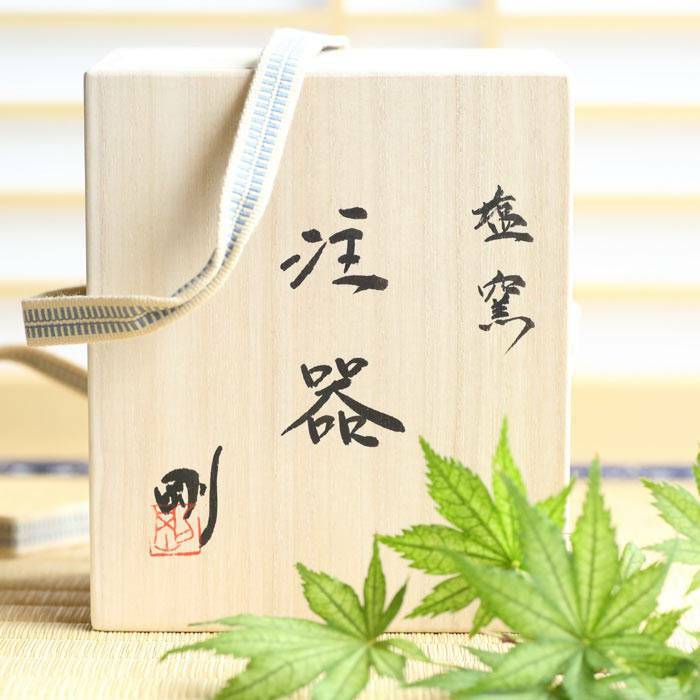 Like those in generations before him, Shimizu rose in time to prepare breakfast by seven, and often remained in the workshop until nine or ten at night. Chores were his responsibility as well -- shopping, car-washing, ferrying his master from place to place -- leaving him little time to himself. 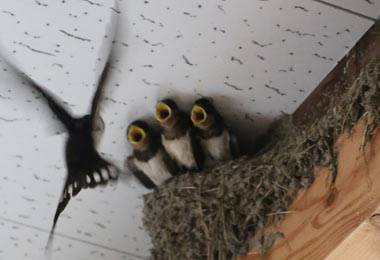 He shared fairly tight quarters – a room just four meters square – with his three fellow apprentices. 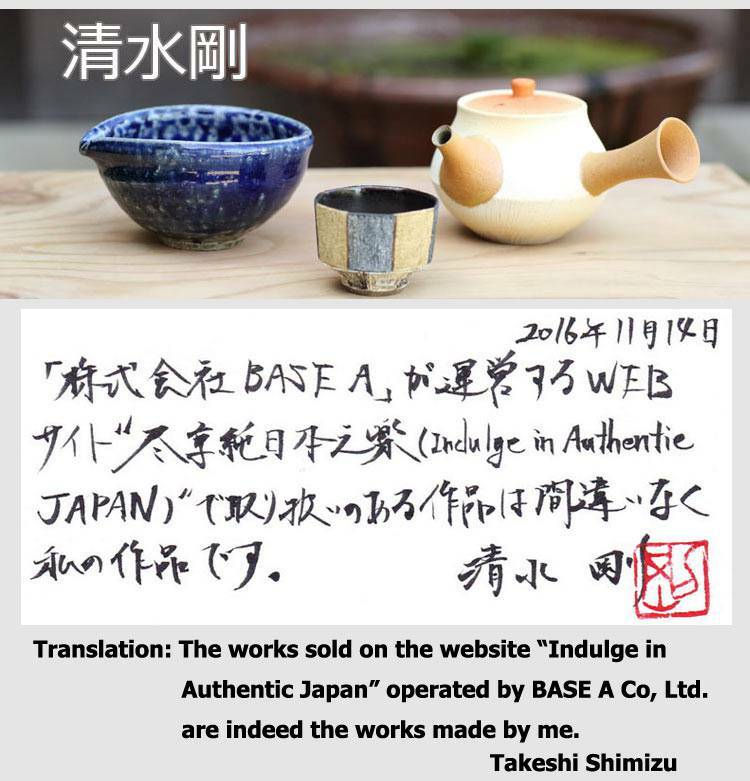 He also received near-constant exposure to Imai’s famed inlay work – the chance of a lifetime. 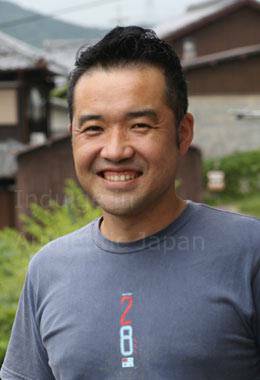 At age 30, after six years under Imai, Shimizu struck out on his own. His guiding lights were his own sensibility and his ties to Tamba-ware, and he explored the nexus of the two. 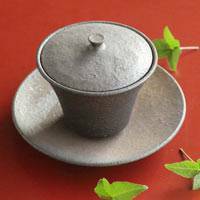 His kokumon style takes hints from 14th-century Tamba pieces, which often featured a so-called cat-scratch pattern consisting of bold grooves. 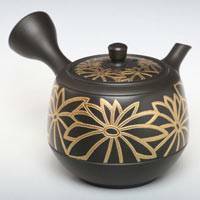 Shimizu’s innovation was to give these two-dimensional, straight-line patterns depth. 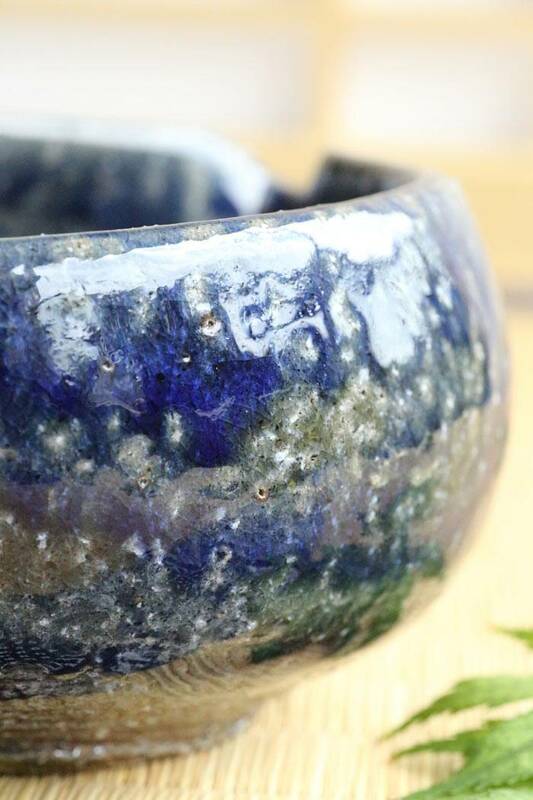 He arrived at salt-glazing three years after forming his independent practice. 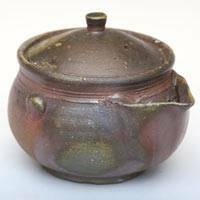 Around the time Shimizu was considering switching to a wood-fired, oven-style kiln, he ran across other practitioners of the style, which itself arose out of the folk-craft movement in Tamba. His favorite color happened to be blue, and the confluence of these factors pushed him to give it a try. 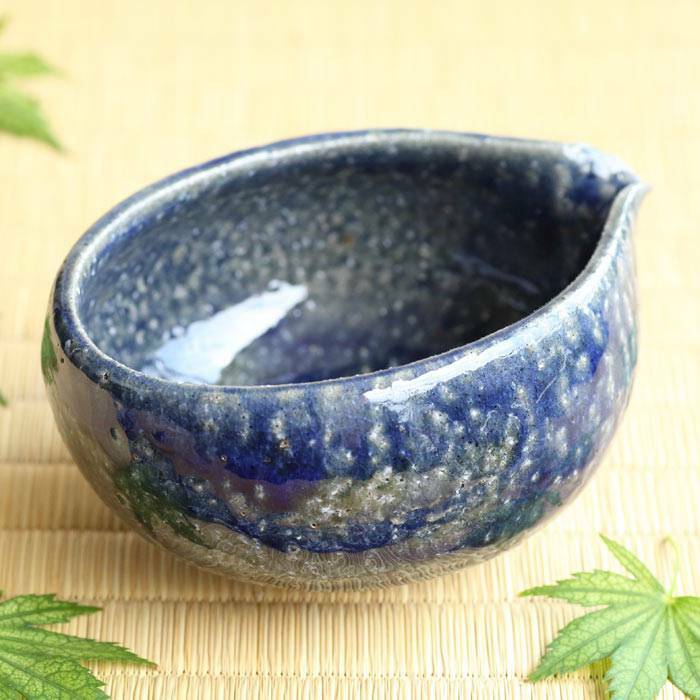 “Now, I’m working on pieces that will be like Edo-period Tamba-ware, but in my own style,” Shimizu says. Of course, the artist works in many other styles as well. 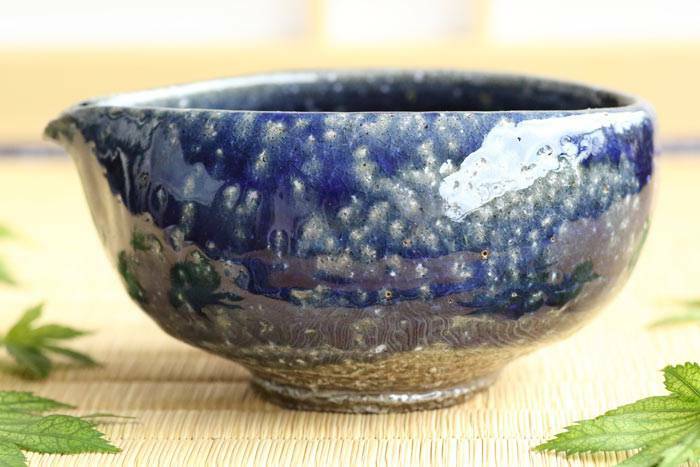 A master of the wood kiln, Shimizu crafts brilliant works as only he can. Please -- take a look.